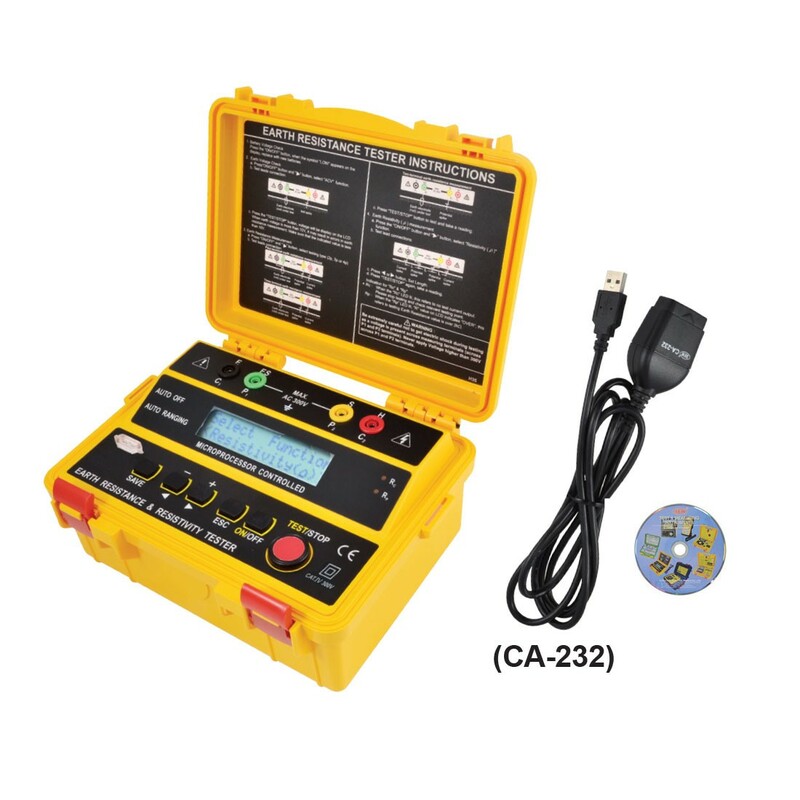 Test key parameters based on earth resistance, voltage, and resistivity for 2-Wire, 3-Wire, and 4-Wire systems. This include spikes for both voltage and current. Up to 200 measurements can be saved to memory for recall and uploaded via USB to RS-232 cable. Earth Resistance: 0-20Ω/ 0-200Ω / 0-2kΩ (±2% Reading + 3 Digits). Earth Voltage: 0-300VAC (±2% Reading + 3 Digits). Resistance Resolution: 0.01Ω / 0.1Ω / 1Ω. Measuring System: Earth resistance by applying a constant current. Operating Temperature: 0ºC to 40ºC / 32ºF to 104ºF . Safety: EN61010-1 CAT IV 600V, EN61557-1, EN61326-1. Included: Manual, Test Leads (Red, Black, Yellow, Green) Data Cable RS-232/USB, CD, Alligator Clips, Shoulder Belt, Carrying Case.